Everything on Okinawa Island from A to Z | Facing language barriers? Broken Japanese and hand gestures are sometimes not good enough when you want to explain to a local Japanese person that you’d like to return merchandise or that you lost something at a local restaurant or shop. 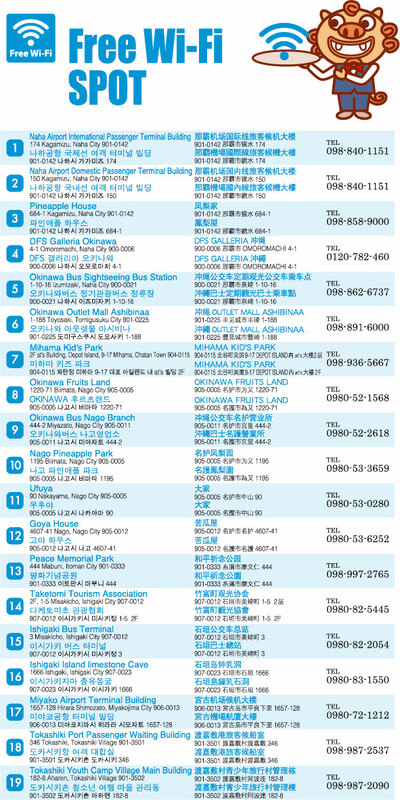 For use in cases such as these, there is a free call center provided by Okinawa Prefecture. You can contact the center on your cell phone, landline or even using Skype, and they will speak to the person you are dealing with. Hand your phone to the person in front of you, and the call center representative will translate your message. English, Chinese and Korean are supported. They also provide emergency information on typhoons and earthquakes. There are no service fees, but normal phone charges will accrue to the customer. This service is available from 9:00 to 21:00 every day until March 31, 2015. In addition to the places listed in the link below, there are some 200 more free Wi-Fi locations available in Okinawa, with a growing number of Wi-Fi hotspots being installed all over the island. >>> Click the link and find your nearest Wi-Fi hotspot!